(1990) "Mama Said Knock You Out"
(1991) "6 Minutes of Pleasure"
"Mama Said Knock You Out" is a hit single by LL Cool J from his album of the same name. The song famously begins with the line "Don't call it a comeback/I've been here for years." 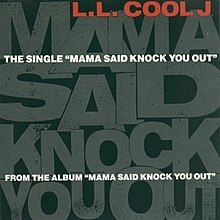 Before "Mama Said Knock You Out" was released, many people felt that LL Cool J's career was waning; his grandmother, who still believed in his talent, told him to "knock out" all his critics. The song was produced by Marley Marl with help from DJ Bobcat along with LL. The single reached number 17 on the Billboard Hot 100, was certified Gold by the RIAA, and won the Grammy Award for Best Rap Solo Performance. The song takes various shots at Kool Moe Dee. The song was featured in the films The Hard Way (which LL Cool J also appeared), Gladiator, Encino Man, Bébé's Kids, Kangaroo Jack: G'Day U.S.A.!, Big Mommas: Like Father, Like Son, Happy Feet Two, Fist Fight, and The House. The song uses samples from James Brown's "Funky Drummer", the Chicago Gangsters' "Gangster Boogie", Sly & The Family Stone's "Trip to Your Heart", the drum break from Digital Underground's "The Humpty Dance", and LL Cool J's own "Rock the Bells". The music video features LL Cool J in a boxing ring, rapping into a microphone similar to the one an announcer would use in a boxing match. Intercut with this are clips of boxing matches and LL Cool J exercising. LL Cool J said in his autobiography that the idea for the song came from a discussion with his grandmother. He had said to his grandmother that he felt that he couldn't survive as a rapper now that gangsta rap was popular and he was being dissed by several up-and-coming rappers. She responded, "Oh baby, just knock them out!" She is featured in the closing scene of the music video, saying: "Todd! Todd! Get upstairs and take out that garbage." (2014) "Wrong Side of Heaven"
American heavy metal band Five Finger Death Punch covered the song for their fourth studio album, The Wrong Side of Heaven and the Righteous Side of Hell, Volume 1. The cover features rapper Tech N9ne. The single was released on March 25, 2014 by Prospect Park Records. ^ LaGrave, Katherine (August 21, 2015). "Why LL Cool J's Most Famous Album Almost Never Happened". Vanity Fair. Condé Nast. Retrieved 23 July 2018. ^ Pareles, Jon (November 18, 1990). "HOME ENTERTAINMENT/RECORDINGS: RECENT RELEASES". The New York Times. Retrieved February 23, 2012. ^ "Mama Said Knock You Out - LL Cool J Song Information". Billboard. Retrieved July 16, 2012. ^ LL Cool J (1998). I Make My Own Rules. New York: St. Martin's Press. pp. 126–127. ISBN 9780312967314. ^ "LL Cool J: Artist Chart History". Official Charts Company. Retrieved September 30, 2012. ^ "Australian-charts.com – LL Cool J – Mama Said Knock You Out". ARIA Top 50 Singles. Retrieved September 30, 2012. ^ "Charts.nz – LL Cool J – Mama Said Knock You Out". Top 40 Singles. Retrieved September 30, 2012. ^ "LL Cool J Chart History (Hot 100)". Billboard. Retrieved September 30, 2012. ^ "LL Cool J Chart History (Dance Club Songs)". Billboard. Retrieved September 30, 2012. ^ "LL Cool J Chart History (Hot R&B/Hip-Hop Songs)". Billboard. Retrieved September 30, 2012. ^ "LL Cool J > Awards". AllMusic. Rovi Corporation. Retrieved September 30, 2012. ^ "American single certifications – L.L. Cool J – Mama Said Knock You Out". Recording Industry Association of America. May 15, 1991. Retrieved September 30, 2012. If necessary, click Advanced, then click Format, then select Single, then click SEARCH.